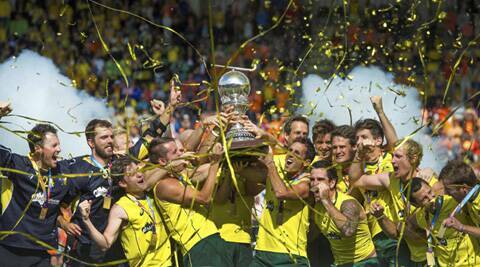 Australia defeated The Netherlands 6-1 in the final to win their second consecutive title. Drag flick specialist Chris Ciriello scored a hattrick as defending champion Australia beat the Netherlands 6-1 to take their second consecutive men’s field hockey World Cup. The Dutch got off to a good start as Jeroen Hertzberger opened the scoring in the 14th minute, dribbling past a defender to drive the ball in from near the top of the circle. But that was the high water mark for the Netherlands, as Ciriello equalised on the first of his three successful penalty corners six minutes later, wrong-footing Dutch goalkeeper Jaap Stockmann. Australia then began a long stretch of dominance, keeping possession and pinning the Netherlands on their half of the field. Kieran Govers, Glenn Turner and Jamie Dwyer also scored for the winners. Stockmann, who was voted `keeper of the tournament, was beaten more decisively on each penalty. “The boys played really well, I was just lucky enough to be on the end of it, finishing it,” said Ciriello. “We had a good push and trap today, and our strikers worked really hard, so it’s not just a hattrick for me, it’s for the rest of the team and for Australia,” Ciriello said. Earlier Sunday, Argentina beat England 2-0 to take the bronze. In the opening phase the Dutch resisted the onslaught that put every other side Australia had faced during the tournament at a disadvantage within minutes. The crowd of 15,000 overwhelmingly Orange fans, including the Dutch king, queen and three princesses, began to hope that the men could duplicate the success of the Dutch women. They beat Australia 2-0 in the women’s final Saturday. But the moment was fleeting. “We kept on fighting at the end but all credit to Australia,” he added.